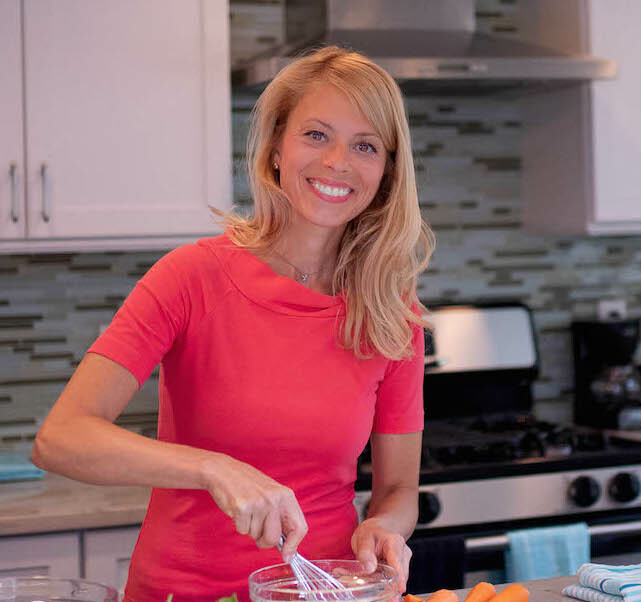 When I had my own catering company, I mastered the art of Prep-Ahead and checklists for everything from labeling platters and spoons, to prepping ingredients each day, to planning table & room decorations, staffing and more. I use this expertise when hosting my own parties these days and I’m now sharing this all with you! 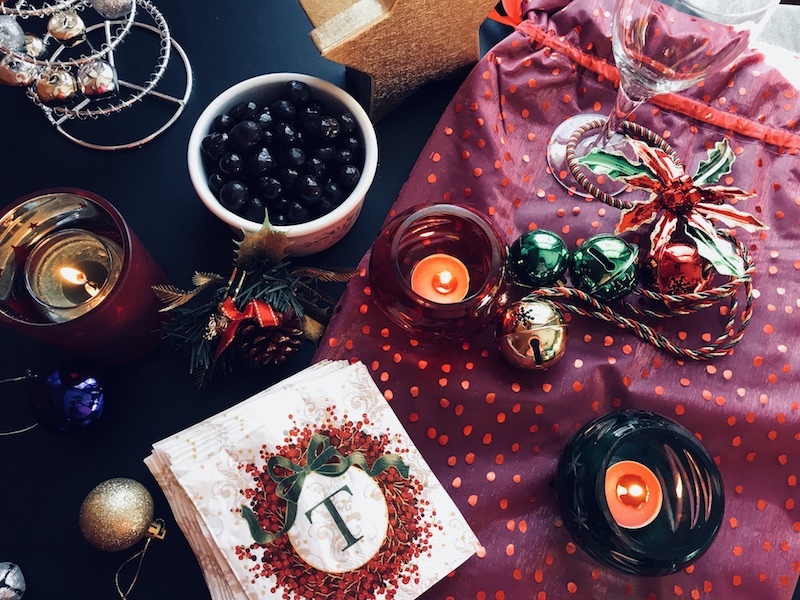 This is my ULTIMATE GUIDE to Hosting a STRESS-FREE CHRISTMAS/HOLIDAY PARTY! It’s a catch-all Christmas/holiday gift to all my friends in 1 night. I make my guests a part of the fun so they have a role to play – one year it was a potluck, last year it was an Ugly Sweater Contest Party! I don’t have to travel: drive/walk/take a taxi/uber/etc! The key to truly enjoying the party, both the preparation and during the party, is to make it simple and ensure that you are not stuck cooking or serving food/drinks the entire time, so that you can enjoy the fun and conversations with your guests. Below are the 5 Tips for a Stress- Free Party, Simple make-ahead & Buy Menu, and Detailed Daily Checklist for a stress-free Fun Night! Keep the guest list tight 20-25 people is a good number, give or take based on your space. Keep in mind that people are busy this time of year, so may not be able to come. Assume an 80% turnout. Be sure to add a few new friends to the mix, so that you can connect old friends to new ones. Make the day of the week convenient If you can take a Friday afternoon off from work, then I think Friday night is the best, as you are not competing with all of the other Saturday night parties and guests do not have to work the next day. However, you can definitely try for a Saturday night or consider Sunday evening. I am recommending appetizers only with an 8pm-11pm timeframe; but you know what times would be best for you and your friends. If you are having this on a Sunday, you may want to consider an earlier party, like 6-9pm. No Dinner, just hors d’oeuvres! Trying to figure out enough food for a meal and then stressing out about how to seat everyone and find enough plates and silverware is just. not. necessary! This should be a fun event for you, not a stressful one. I recommend having a cocktail party with stationary hors d’oeuvres. You will want to have enough for the people that didn’t have time to grab dinner, but you will also want to let guests know that you are not serving a meal on the invitations: Light hors d’oeuvres will be served. Engage your Guests I love to include my guests in the party fun even before the party by asking them to bring something. Last year it was a Wear-Your-Ugly-Holiday-Sweater. The year before that it was a White Elephant gift party. You can also ask them to bring in the funniest/craziest christmas/holiday decoration. This is NOT a must for your party, but can add some light-heartedness to the event. Prep ahead! Ok, here we get into the fun stuff! Make a list of everything that you need to get done prior to the party with due dates and check items off as you go. You are in luck! I have done this for you below 🙂 And now the REALLY FUN part! The Food Prep!!! I mastered the art of pre-ahead during my catering days. I have given you tips below on what can be done in advance, but make sure that you carve out a little time each day/evening to prep food so that you are not leaving it all for the day of. This assumes that you are having a cocktail party with stationary hors d’oeuvres that are heavy enough to tide people over from/to a meal. Guest count assumed is 25. Adults only. Time: 8pm-11pm (give or take based on your preference). I always make a few things from scratch and buy/assemble a few more. I love being able to show I cared enough to cook but be real enough to say I’m not superwoman! I also love FreshDirect because you can order beautifully assembled platters; however, I personally like creating my own as it costs less and I can put my personal touch to it. Check with your local grocer if you want the added convenience of pre-assembled platters. Here are my recommendations, but of course, swap in/out any items that you want to make this your own. Check the RSVPs to see what your final count is looking like and follow up with anyone that you have not heard back from. Print out all recipes (including the platters listed above) and make your shopping list! 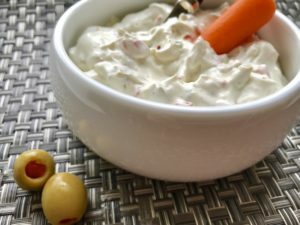 Buy all groceries, EXCEPT the following, which you will want to buy closer to the party: (a) salami & prosciutto for antipasto platter (b) cheese for cheese platter (c) fresh jumbo lump crab meat. Purchase all non-perishable and decorative items: napkins, toothpicks, candles, elegant clear plastic glasses, short & tall, if you do not have enough glasses in your house. Buy Beverages – If going with Wine, Water, and Sodas, buy 18-20 bottles of wine split across red and white (assumes 20 guests drinking 2 glasses of wine per hour for 3hrs – your friends might not drink this much!). Buy sparkling water, flat water, 2L Coke, 2L Diet Coke. Make the Hanky Panky and freeze them on a sheet pan so that they do not freeze together. You can cook them from the frozen state. Once they are frozen, you can either keep them in the freezer covered on the sheet pan or transfer them to a freezer bag. 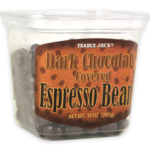 Chocolates – I am a bit of a chocoholic and so I am giving the chocolate treats their own checklist item :). 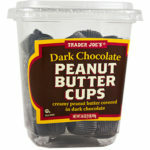 I particularly love the Trader Joe’s Dark Chocolate Covered Espresso Beans and the Dark Chocolate Peanut Butter Cups. However, get whatever chocolates you like best. The key is to have a few bowls of bite-size chocolates around to satisfy the holiday sweet tooth. Set out all decorations in another room so that you can make sure you have what you need…put candles in holders, etc. Pick out platters, bowls, ice bucket/bowl, and any other servingware that you will need for the party and place sticky notes on each indicating what they will be used for. You will need 1 large platter each (3 total) for the Antipasto, Crudite, & Cheese/Crackers platters. 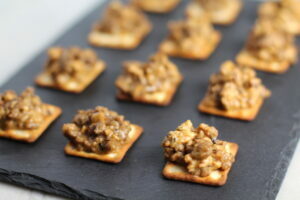 You will need smaller dishes/platters (2 total) for the meatballs & Crab Salad Canapes. You will need small bowls (6 total) for the chocolates (2), cashews (2), and olive dip (2 – 1 for platter and 1 backup ready to go). A larger bowl (1) for the Edamame Dip and a plate/bowl/basket (1) for Chips to go with the Edamame dip. Small bowls (2 total) for the meatballs dipping sauce and garlic butter for the breadsticks on the antipasto platter. You will also need a glass for the breadsticks, toothpicks and toothpick holder for the meatballs, and cheese knives for the cheeses, spreading knife for the garlic butter, spoons for the Edamame Dip and Olive Dip. If you want to, cut or slice the hard cheese. This is not necessary though. If the salami that you bought was from the deli, cut it into quarters so that you can fan out each triangle pile on the platter later. If you bought a salami sausage, slice it into 1/8 inch slices. Store in fridge again. Buy the Jumbo Lump Crab Meat. 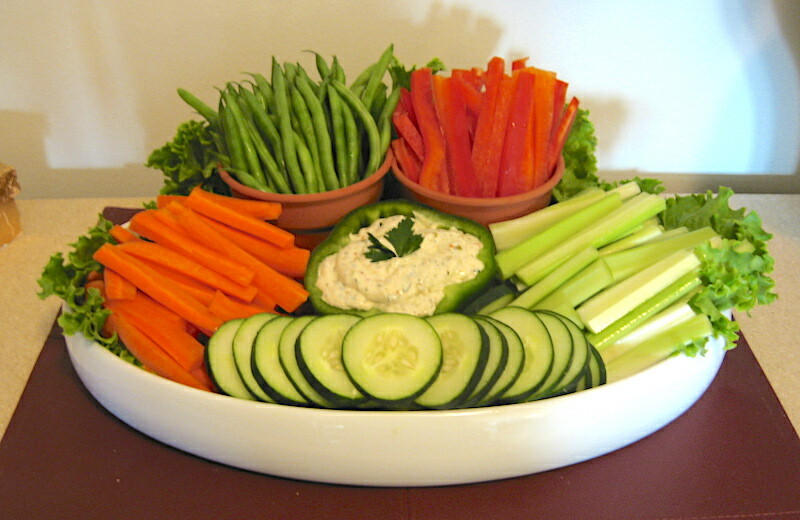 Cut Carrots, Celery, Red Pepper, and Zucchini all into sticks and arrange Crudités platter with dip bowl. Cover with plastic wrap and store in fridge. Below is one of my platters, but design it your own way and put in any veggies that are your favorites! Make the Bruschetta Topping . Toast the baguette. click here for recipe. Morning: First thing in the morning, create the Antipasto Platter by placing each of the ingredients you purchased in sections of the platter. Add the garlic butter and breadstick glass either on the platter or next to it. and store in fridge. Morning: Make the Cheese Platter IF you have space to keep it in the fridge. If not, make it right before the party starts. You can really arrange it anyway you want. Here is an example of a platter that I did for catering. I do NOT recommend stacking up cheese this way, since you are home and can replenish it. I love using menu cards to let guests know what kind of cheese it is. You can take an index card and fold it in half to stand. Morning: Combine the Lump Crab Meat with the dressing. Afternoon: tables where you will place any food or beverages: tablecloth, decorate with confetti or tinsel, ball ornaments, candles. 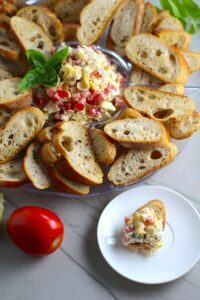 1.5 Hours before party, prepare the bruschetta platter, by placing toasted baguette out. 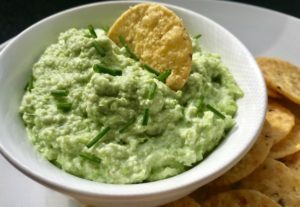 Put the topping in a serving bowl with a serving spoon or spreader, but keep in the fridge until the party starts. 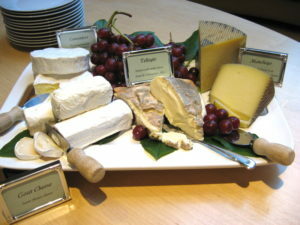 1 Hour before party, make the cheese platter if you didn’t already do that in the morning. 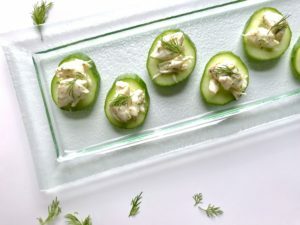 1 Hour before party, put the Crab salad on the cucumbers and plate first batch to put out. Store all in fridge until party. 30 minutes before party, place Hanky Panky on sheet pan and bake for 15 minutes. Serve in batches of ~15 at a time and prepare another tray to go into the oven. Replenish as needed. If you have a hot plate, you can put them all out at once. 20 minutes before party, put all platters out. 10 minutes before party, pour yourself a drink and get ready to have fun! !